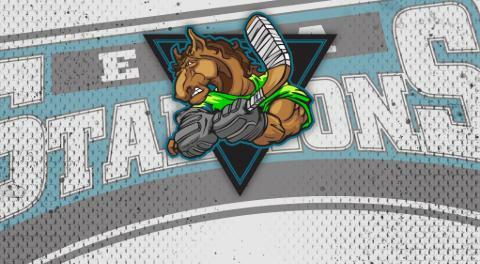 The Essa Stallions ended there regular season Sunday night, with an 11-9 victory over the Seaforth Generals. Yes, you read that right, 11-9. This capped off an 8 game winning streak to end the regular season for "The Herd". Highlight of the game has to be Tim Holmstrom. "Homer" as we like to call him, scored his league leading and league record 59th goal of the season, and added 3 assists, to get his point total to 110 on the season, Also a CPJHL record. What a way to back up your 2018 MVP season. "Obviously the luxury of having Tim is huge for us. He is a game breaker. We're truly so happy for him and what he has accomplished. Hopefully it continues in the playoffs" said Head Coach and Director of Hockey Development Sylvain Cloutier. "It's funny you know. Games over, and I do my rounds around the room congratulating guys on a job well done...and I got to Homer..say congrats, proud of you and all you've done...he comes back with "All I've done, couldn't be possible without you guys and my teammates" If that single quote doesn't explain to you what type of person he is, I'm not sure you'll ever understand" said GM and Assistant Coach David Lang. After some controversy and the win, the Stallions, despite having more regulation time wins, will finish 2nd in the league due to head to head losses to Markdale (4-2 season series). This will see Essa take on the Smith Falls Settlers in the 1st round of the CPJHL playoffs, which is a rematch of last years CPJHL Presidents Cup finals. "It's funny how hockey works. We end up starting the journey this year, where it ended last season. We're hoping for the same result, but we'll be taking this one step, and one shift at a time" said Lang. Game one goes this afternoon at "The Barn" @ 2:00 p.m. puck drop. The Stallions will then hit the road on Wednesday to Smith Falls for game 2. The Quest for the Prez starts this afternoon! Let's go Stallions!